I have to remind myself that I have been in Laos for less than 36 hours. It feels like a very long time. Everything and everyone is welcoming and simple. No traffic, no noise, no cell phones, no crowds, no garish modernisms. The pace quieter, the days longer, the moments richer. 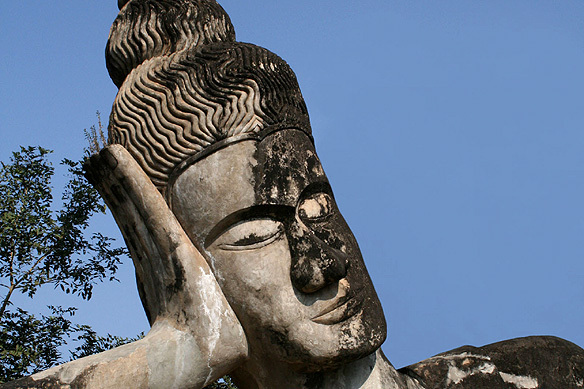 The most frequently used word to describe Laos is “forgotten” due to its isolation from global politics for two decades. From 1975 when the Pathet Lao communist government seized power to the 1990s, the country was cut off completely from the West insulating it from the effects of rapid modernisation and imbuing the whole country and its people with a childlike innocence. The concept of begging is non-existent, with even the poorest of the poor preferring to earn a living rather than beg for it. Vientiane is small. 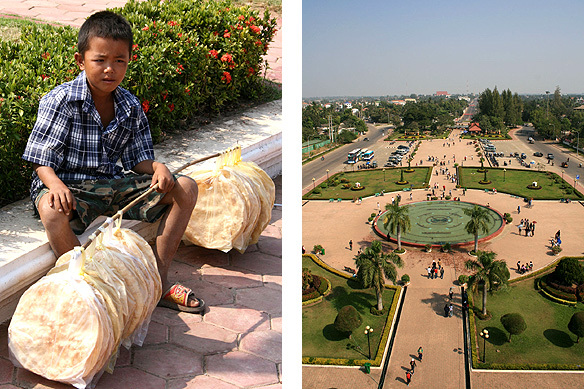 And because of Laos’ segregation from the world, development has not been at the price of its culture or pace of life. DJs are not allowed, there is a curfew after 11:30 pm, women are encouraged to wear the national dress, the sinh, and all radio stations have to play a certain percentage of local music. Brightly coloured tuk-tuks plough the tree-lined boulevards whilst children play hopscotch on the sidewalks. English is rarely spoken, even less understood, but a smile hovers on everyone’s face turning into an instant beam in response to your sabaidee (hello). Much of my first day was taken up with a visit to the Garden of Thousand Buddhas just outside Vientiane, where heavily symbolic and exotic Buddhist and Hindu images crowd together in a park. It was a nice afternoon—a cup of Lao coffee, a gentle breeze and gorgeous views of the Mekong and golden sandbanks, with Thailand stretched out lazily in a long green belt across the waters. Most of the sights in Vientiane are of religious significance with Wat Sisaket and Wat Phra Keo being Vientiane’s two national museums. 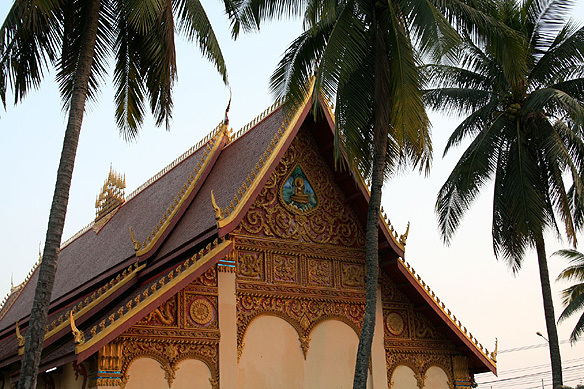 Built in 1818, Wat Sisaket is home to the head of the Buddhist community in Laos. It is one of the key temples in the capital and houses over 7,000 images of Buddha. Wat Phra Keo, across the road from Wat Sisaket, was never a monastery but used instead for royal worship. It was built in 1565 by King Setthathirat to house the Emerald Buddha, which was removed by the Thai in 1779 and is now in Bangkok. 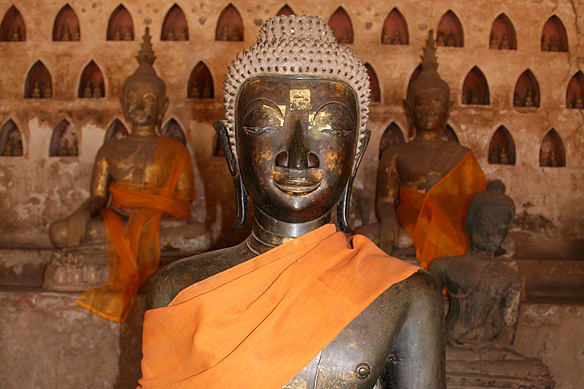 Vientiane’s most important site and the holiest Buddhist monument in the country is the That Luang. According to legend, a stupa was originally built here in the 3rd Century AD by emissaries of the Indian emperor Asoka and was said to contain the breast bone of the Buddha. Excavations at the site, however, contradicted the legend. 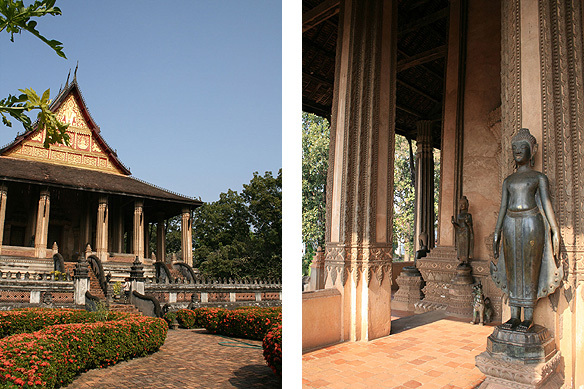 The present monument was built by King Setthathirat in 1566 whose statue stands outside. 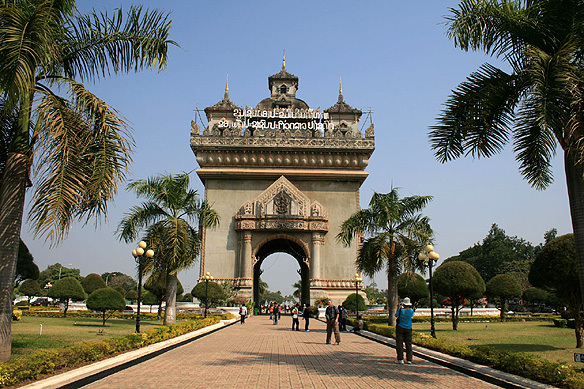 On the city’s main thoroughfare is Vientiane’s answer to Paris’ Arc de Triomphe and the country’s best known landmark, the Victory Monument or Patuxai. It is also known as the vertical runway. The nickname refers to the fact that it was built in the 1960s from funds the US government gave to the Lao government for the specific purpose of extending the runway at the airport. 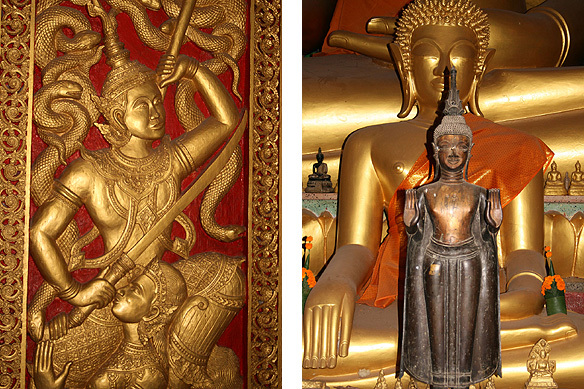 My last impressions of Vientiane were of dusk-kissed wats surrounded with swaying palm trees and golden images of Buddha. Yes, I spent my time wat-hopping. There are so many of them, with each one having its own unique character. Wat Mixay, Wat Chan, Wat Ong Teu. You would think you had seen it all and then a little alley opens into a wat so incredibly beautiful and ethereal that it takes your breath away. Slowly the sun set, darkness filled the streets, and yellow lights lit up the sleepy town as traffic started to buzz and French restaurants opened their menus for travellers and locals alike. It was time for me to say good-bye. 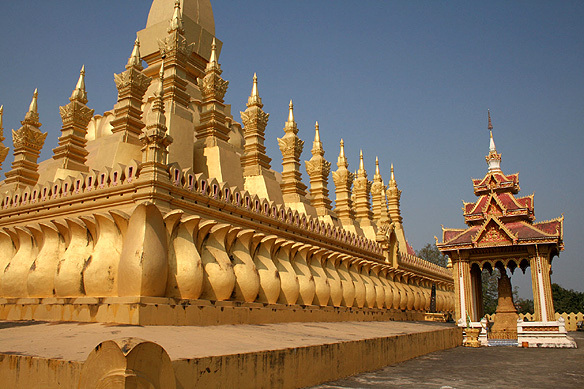 This entry was posted in Exploring our World, Laos and tagged Buddhism, Emerald Buddha, Garden of Thousand Buddhas, Laos, Patuxai, That Luang, Things to do in Laos, Victory Monument, Vientiane, Wat, Wat Phra Keo, Wat Sisaket by Rama Arya. Bookmark the permalink.